Each transaction is guaranteed to be safe, secure, and private. Personal info and credit card data are transferred online securely (through SSL encryption technology), and kept strictly confidential. Neu-Becalm'd™ is a nutritional supplement that gives the brain-targeted nutrients to aid in the balancing of neurotransmitters. Problems such as mental and emotional focus, behavior, anger, depression and sleeping problems may be caused by an imbalance of neurotransmitters in the brain. 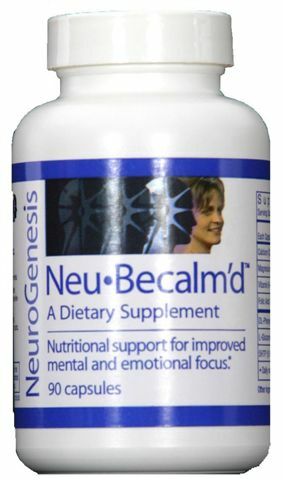 Buy 3 Neu-Becalm'd - Get 1 free - total $127.50 plus S&H. No Autoship. 6 Bottles of Neu-BeCalm'd at the One Time Preferred Price of $226.50 - Free Shipping. Neu-Relieve™ (formerly known as Neu-Recover BZ) is nutritional support for the natural replenishment of neurotransmitters depleted by the long-term use of tranquilizers or benzodiazepines. Buy 3 Neu-Relieve - Get 1 free - total $117.00 plus S&H. No Autoship. 6 Bottles of Neu-Relieve at the One Time Preferred Price of $207.00 - Free Shipping. We have now packaged two great products together: Neu-Becalmd and Neu-Relieve. These two synergistically combine to aid the process of regaining your good health. For Those Who Are Tapering From The Excessive Or Prolonged Use Of Pain Pills Or From The Use Of Opiate Drugs Such As Heroin Or Methadone. Neu-Recover™ (formerly known as Neu-Recover DA) Nutritional Support ForReplenishment of NeurotransmittersDepleted by the Long Term Use of Alcohol. Buy 3 Neu-Recover - Get 1 free - total $127.50 plus S&H. No Autoship. 6 Bottles of Neu-Recover at the One Time Preferred Price of $226.50 - Free Shipping. Neu•Replenish™ (formerly known as NeuRecover SA) is formulated for the neurochemistry that is depleted of dopamine, norepinephrine, GABA and serotonin through the use of chemical stimulants. Buy 3 Neu-Replenish - Get 1 free - total $127.50 plus S&H. No Autoship. 6 Bottles of Neu-Replenish at the One Time Preferred Price of $226.50 - Free Shipping.